Offering practical assistance to empower female headed households and widows to create sustainable employment/self employment opportunities to increase their food and housing security. Increasing educational opportunities for the children of these women by the provision of scholarships to help them attend university. Sakila has three children and is hearing impaired. When this photo was taken in an Internal Displaced Person’s Camp in 2015 she had no food to feed her family. In 2016 she was given a distribution of materials by Ten for Tamils to create a small food business. She now has a sustainable income stream which has dramatically increased her food security. There are an estimated 70,000 Tamil Widows in Sri Lanka created by the civil conflict between the Tamils and the ruling Sinhalese which ended in 2009. These women call themselves the “forgotten” people. What it means to support themselves. They have very limited work skills and no way to support themselves other than doing the odd Koolie jobs and some days they have very little food to eat. The children are malnourished and lack educational and work opportunities. Just $10 AUD a month. 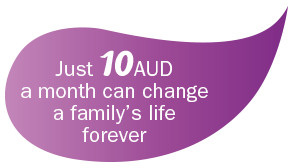 The price of one meal in Australia can have a huge and lasting impact on the lives of these Tamil families. Take a video tour of an Internal Displaced Persons Camp. Meet some of the Tamils Ten for Tamils is helping. Help with Ten for Tamils now! Your $10 a month will make a huge difference to a Tamil. Subscribe to our newsletter to stay up to date with Ten for Tamils.